Now you can tell stories, not just read them. Storycard Theater® books are printed in Japanese kamishibai format — sturdy cards with colorful art on the front for the audience and dramatic text on the back for you. With kamishibai (literally “paper theater”) you can read to a group of children while showing them the pictures. 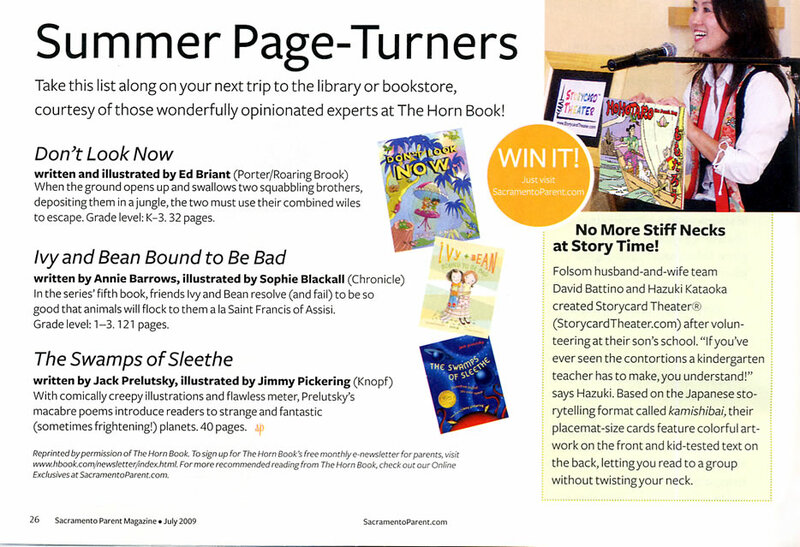 No longer do you have to twist your neck to read a picture book! And with the freedom to look your audience in the eye, you communicate more naturally. Reading becomes storytelling. It’s easy and fun. Our cards are 10x13" — small enough to hold comfortably, yet large enough to showcase the colorful artwork. The back of each card features clear, kid-tested text and a smaller version of the image the audience is seeing, so you always stay matched up. Storycard Theater books are ideal for classrooms, birthday parties, daycare centers, family gatherings, and for students learning English. In fact, many children enjoy performing them for each other, or inventing their own stories based on the artwork. The kamishibai (kah-mee-shee-bye) format is part of a long tradition of visual storytelling. As far back as the 12th century, Buddhist monks traveled Asia with picture scrolls to enhance their stories and lectures. Leaf Moon Arts is a Japanese-English publisher and storytelling collective based in Folsom, California. Inspired by classic folktales from around the world, we strive to produce stories that demonstrate positive themes to children, such as kindness, friendship, and honesty. 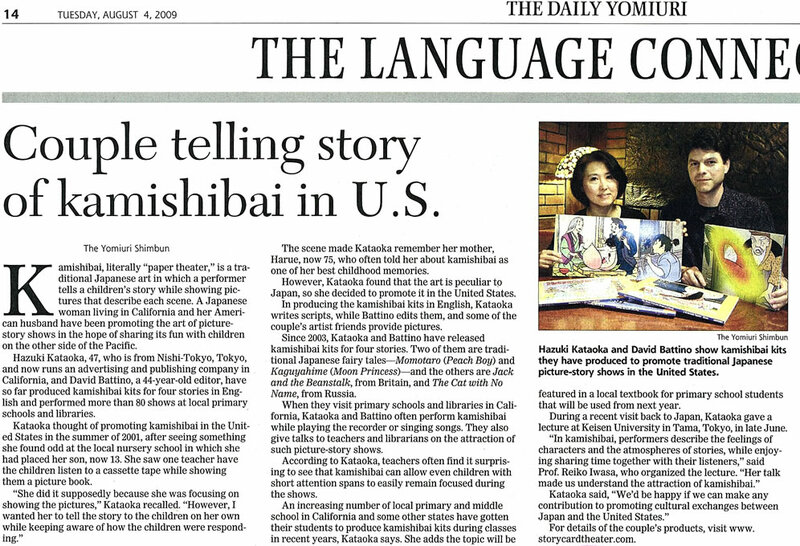 Newsflash: Sign up for our free monthly newsletter: kamishibai news, storytelling tips, and advance notice of events.